When I was growing up, New England boiled dinner was a treat that my grandmother served fairly often. My Mom made it occasionally too, but it is really a dish I associate with Grandma Palmer. I can still remember how thrilled she was that I loved “ham and cabbage,” as she called it. Yep, that’s right. Ham. A smoked picnic ham to be precise. I never tasted corned beef until I was in my late 20's, and I have to say, I was not impressed. I don’t think I cooked it long enough because it was tough and fatty – my two LEAST favorite things. Plus it made my whole house smell terrible! Last week I found a good sized hunk of corned beef for $4 and some change and decided to give it another try, simply because it is the season AND it fit my budget. Plus I had corned beef on the brain – literally. I had spent the week working on a story about all the St. Patrick’s Day events on the Cape and you can imagine how often the words, “corned beef” came up. 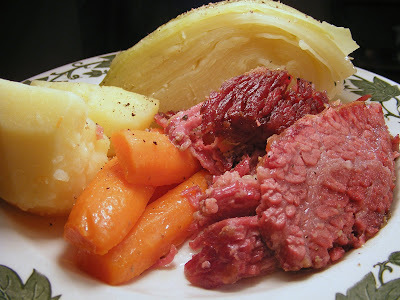 I learned that my Grandma’s recipe is actually closer to a real Irish boiled dinner than the corned beef variety. Falmouth pub owner Liam Maguire, a native of Ireland, told me he had never tried corned beef until he came to this country. Joe O’Shea at O’Shea’s Olde Inne in West Dennis said that his grandmother made the same dish as mine with a picnic ham as a substitute for “Irish bacon,” which he describes as a fresh cured pork loin. He will try to replicate it at his pub tomorrow. Apparently corned beef is an Irish American food, and not an Irish one. Liam explained that it was a cheap food introduced to the poor Irish immigrants by their Jewish neighbors in cities like New York and Boston. I’ve gained a whole bunch of more experience cooking since my first corned beef disaster, so this time I decided to boil the corned beef for 2 and a half hours in water and then roast it for an hour, while I cooked the veggies in the corned beef liquid on top of the stove. I suspect I’m never going to be a huge corned beef fan, but this one was actually tasty. Roasting the corned beef gave it a wonderful crispy exterior and helped render a lot of the fat (but alas not all of it – diet food this is not). Here come the eggs! Seriously, the best part of the corned beef dinner for me was the hash I made from the leftovers. 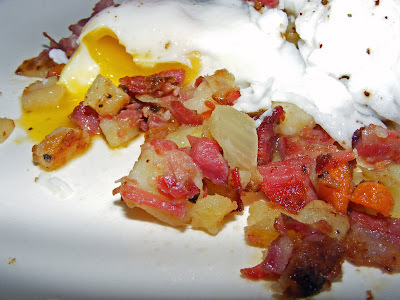 In fact, I would consider cooking corned beef again just so I could make this hash again. I finely chopped the corned beef and sautéed it with some of the leftover potatoes that I diced. I had one carrot left over and a tiny bit of cabbage so I chopped them up too and threw them into the skillet. Cook until golden brown crust forms. Top it with a couple of poached eggs - Now that was truly delicious! Rinse corned beef off under cold water and place in Dutch oven. Fill pan with water until corned beef is almost covered. Add pickling spice and pepper to water and bring to boil. Turn down to low heat and simmer for 2 1/2 hours. Remove corned beef from cooking liquid and place in dark enamel roasting pan. Bake at 350 for 1 hour. In the meantime, prepare the vegetables and add to cooking liquid. Simmer for 30 minutes or until tender. Slice corned beef and serve with veggies on a platter. What a fun hash..just in time for Saint Patrick's Day. ahh! sensory overload!!! i don't know which one i am more excited about - the corned beef or the hash!! they both sound so good! Gotta admit it, I'm a fan of the corned beef. Also a fan of finishing it in the oven. Can't beat tender beef with a crisped exterior. But, ah! The thought of a bit of hash in the morning... truly lucky stuff! Absolutely beautiful! The eggs on there...oh yeah. You just crack me up with the hash and eggs because I'm the same way! Everything looks fantastic but I know I would be looking forward to the leftovers even more. Happy St. Patrick's Day Laurie! Homemade hash + ooey gooey eggs on top = heavenly delicious!! Seriously, it doesn't get better than that! Happy St. Patrick's Day!! my internet was done all day yesterday; a torn wire in the street. ugh, it's awful being without internet. so, today I am a happy camper. I love love love corned beef hash. I eat a lot of it and that's bad. the marshland in sandwich has decent hash (in case you're ever down this way). give me some hash and hollandaise sauce and I'm in heaven. this all looks so good. 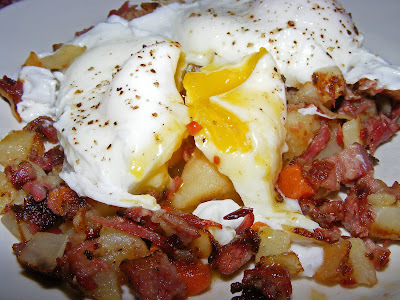 I love corned beef hash- though I too am just kinda so-so on corned beef itself. How would I do a "boiled dinner" if I wanted to use ham? Same recipe, different meat? Or does the methodology differ? This is a really interesting post - corned beef with parsley sauce is a really old-fashioned Australian dish (which I love) and I always thought we got it from the Irish immigrants!